The most important holiday in China is Spring Festival, one of two “Golden Week” holidays in China. It is similar to Christmas in the West in many ways. Families unite and bring gifts. There are certain traditions such as fireworks or making special food. For many people who work in the big city, it is the only time of year they see their parents and other family back at their hometown, which makes it one of the happiest times of year. It is also the busiest time of year. Millions of Chinese need to board trains, buses, cars and planes to travel near and far to return home. Almost the whole country shuts down for one to two weeks as everyone uses their extra vacation days to extend the weeklong national holiday for a few extra days or weeks. It’s not uncommon for some people to take the whole month off as they might not see their family again for another eleven months. For this reason it’s almost impossible to find tickets to travel anywhere in China during the end of January or early February. If you are lucky enough to find a ticket, prices will be much higher than usual. Perhaps the best strategy is to buy a plane ticket several months in advance. Because of the high price, planes are not the transport option of choice for most Chinese people, but that is changing each year as Chinese people become more wealthy. The busiest time of year is also one of the most lucrative. Millions of people need to buy presents to bring back home such as new clothing, gold jewelry, fruit and other snack food as well as a variety of drinks or cigarettes. 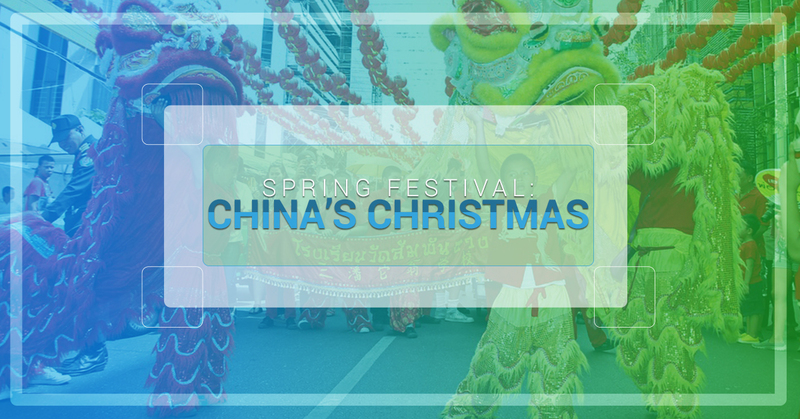 Once you arrive home, you’ll want to make sure to watch the Spring Festival gala on TV which is a four-hour variety show that became a national tradition over 30 years ago. Before midnight on Chinese New Year’s Eve, everyone goes outside to shoot off fireworks and welcome the new Chinese New Year as well as scare off any evil spirits or ghosts. The next day will be busy with eating and visiting with family. Over the course of the week, most people are able to see every family member from grandmas and cousins to uncles and aunts who aren’t necessarily related to you. Another tradition for Spring Festival is to decorate each doorway in your house with red lanterns and signs with Chinese writing on them which say “good fortune”. You will see lots and lots of red decorations during this holiday season. Sadly, all good things must come to an end. The official last day of the holiday is Lantern Festival which occurs on the 15th day of the first lunar month.